Mother's Day is right around the corner! 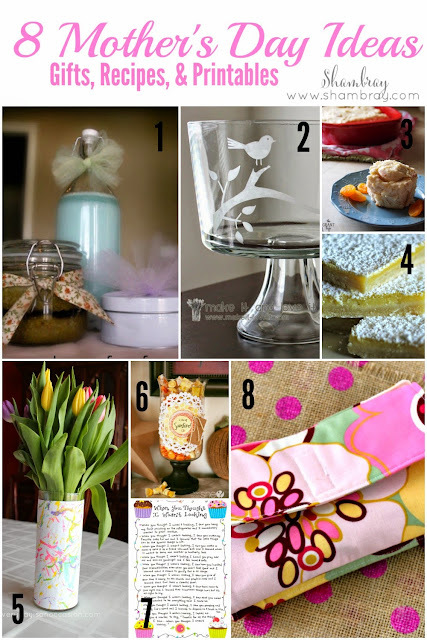 So I have compiled a list of ideas that you can use as inspiration if you still haven't gotten Mom something or if you want to make the day just a bit more special. 1. The Gift of Relaxation from Sweet Charli: I do not know a mom on this earth that does not want to relax. One of my dear friends, Kami, from Sweet Charli put together a perfect gift for Mom on Mother's Day with this gift of relaxation. They are all handmade and perfect for mom. 2. Glass Etching from Make It & Love It: I have never done glass etching, but after seeing this blog post I am going to do it for sure. This is a great way to give Mom something that is personalized and useful. Etch something in glass for her to make a dish even more pretty! 3. Apricot Sweet Rolls from The Grant Life: Are you looking for something to make Mom in bed on Mother's Day morning? These just might be them. They look and sound so delicious. 4. Lemon Bars from Pink When: Lemon bars are so refreshing. Why don't you whip these up and help Mom feel refreshed this Mother's Day? 5. Child's Artwork on Vase from Every Day is an Occasion: This gift is so simple, but so sweet. Every mom loves their own child's art work (same goes for grandmas). This gift is a great one for young kids to give moms and grandmas. 6. Jar of Sunshine from How Does She: I love this gift idea. It is very inexpensive, but packed with meaning. Those make the best gifts, don't they? 7. Mother's Day Poem from Happy Home Fairy: This is such a simple gift you could give by printing off the poem and putting it in a nice frame. You could also set it up before Mother's Day as a decoration and a reminder to Mom that she is special. 8. DIY Traveling Jewelry Case from The Princess & her Cowboys: I absolutely love this. I need one of these! Jewelry while traveling can be quite tricky. Take that frustration away from Mom, but making her this jewelry case. BONUS IDEA: I had to throw in one more idea for you. If you want to give something to Mom that she can wear all day. 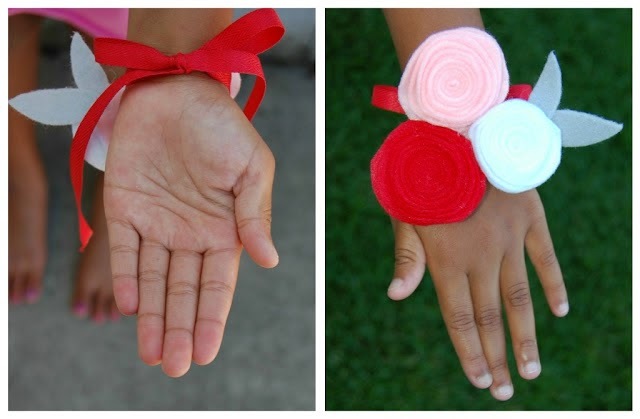 Here is a great DIY for you, a felt flower corsage. I hope you enjoyed this list! Have a fantastic Mother's Day! Thank you for sharing the poem from Happy Home Fairy! Happy Mother's Day! I LOVE that poem! I cry every time I read it. It doesn't matter how many times I read it. Fun ideas! I have been wanting to try glass etching for years. I gotta do it! Thank you for letting me showcase your great gift idea!